You know this thing about Pig Goat Banana Cricket Games? In a crazy world with interesting characters you are going to step into while playing Pig Goat Banana Cricket Games on our website! With the four titular characters you are going to have a lot of fun for sure, so wait no more, and start playing Pig Goat Banana Cricket Games only on www.cute-games.com, right now! In Pig Goat Banana Cricket Games you can find 9 games that we've published for these kids and childrens that are interested to play Pig Goat Banana Cricket Games, this game gategory have been created on 16.05.2016. These games with Pig Goat Banana Cricket Games have been voted 1 times and the avarage of vote is 5.00 stars. We advice you to play the last flash game from Pig Goat Banana Cricket Games, Scary Brawl that have been published on 24.09.2017 12:00. 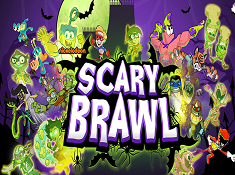 Scary Brawl its a part of Nickelodeon Games category and until now its played 936 times. Try it now on Cute-Games.com! If your like the Scary Brawl game you can write a comment in the game page. Recommend this game to your friends if you like it! 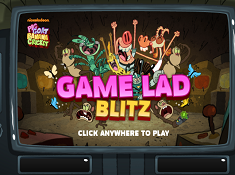 Game Lad Blitz its a part of Pig Goat Banana Cricket Games category and until now its played 1174 times. Try it now on Cute-Games.com! If your like the Game Lad Blitz game you can write a comment in the game page. Recommend this game to your friends if you like it! 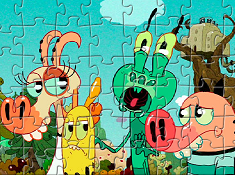 Pig Goat Banana Cricket Characters Puzzle its a part of Pig Goat Banana Cricket Games category and until now its played 742 times. Try it now on Cute-Games.com! If your like the Pig Goat Banana Cricket Characters Puzzle game you can write a comment in the game page. Recommend this game to your friends if you like it! Pig Goat Banana Cricket Memory Cards its a part of Pig Goat Banana Cricket Games category and until now its played 761 times. Try it now on Cute-Games.com! If your like the Pig Goat Banana Cricket Memory Cards game you can write a comment in the game page. Recommend this game to your friends if you like it! Pig Goat Banana Cricket Coloring its a part of Pig Goat Banana Cricket Games category and until now its played 747 times. Try it now on Cute-Games.com! 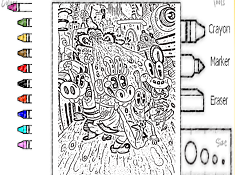 If your like the Pig Goat Banana Cricket Coloring game you can write a comment in the game page. Recommend this game to your friends if you like it! Pig Goat Banana Cricket Puzzle 2 its a part of Pig Goat Banana Cricket Games category and until now its played 680 times. Try it now on Cute-Games.com! 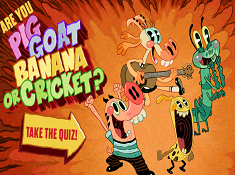 If your like the Pig Goat Banana Cricket Puzzle 2 game you can write a comment in the game page. Recommend this game to your friends if you like it! Are You Pig Goat Banana Or Cricket its a part of Pig Goat Banana Cricket Games category and until now its played 798 times. Try it now on Cute-Games.com! If your like the Are You Pig Goat Banana Or Cricket game you can write a comment in the game page. Recommend this game to your friends if you like it! Pig Goat Banana Cricket Memory its a part of Pig Goat Banana Cricket Games category and until now its played 689 times. Try it now on Cute-Games.com! 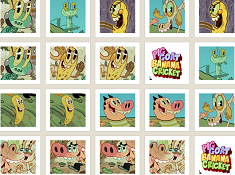 If your like the Pig Goat Banana Cricket Memory game you can write a comment in the game page. Recommend this game to your friends if you like it! 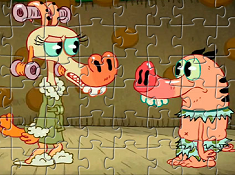 Pig Goat Banana Cricket Puzzle its a part of Pig Goat Banana Cricket Games category and until now its played 636 times. Try it now on Cute-Games.com! If your like the Pig Goat Banana Cricket Puzzle game you can write a comment in the game page. Recommend this game to your friends if you like it! Find More About Pig Goat Banana Cricket Games! You can now play on www.cute-games.com Pig Goat Banana Cricket Games, which is the Nickelodeon Games category which we have just recently created, because we thought that the fans of this show would also love to interact directly with their favorite characters, and be able to play games with them. Also, we have created the Pig Goat Banana Cricket Games category because we found the games based on this show to be very fun, interesting, and they did not bore is for even a second, which is very important when playing online games, right? Well, you can now enjoy all these Pig Goat Banana Cricket Games yourself, only here, on www.cute-games.com, where daily, the best games on the internet are added for you, and we are pretty sure that you play many of them with a lot of enthusiasm. 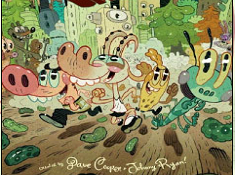 Now, we understand that there may be people who are now reading this, but are not really familiar with the Pig Goat Banana Cricket Games category and the Nickelodeon cartoon it was based on, the caracters or other interesting trivia. That is exactly why you can keep reading this description, and get to know the Pig Goat Banana Cricket Games better, if you want to learn more before you start playing the games on this page! 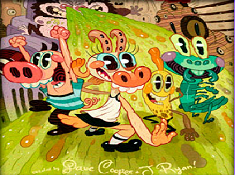 A show with a wacky name like Pig Goat Banana Cricket can't be boring, right? Well, it is not, and the four words in the title represent the names of the four main characters which you are going to follow in the show and play with the Pig Goat Banana Cricket Games, and they are Pig, Goat, Banana, and Cricket. The four are best friends and also roommates, and we want you to know them better if you are not watching the show. Pig is obsessed with pickles, Goat wants to be a musician, Banana loves video games, and Cricket is a mad scientist. The four live in Boopelite City, which is a very strange city, full of robots, animals, creatures and other interesting things, and something is always happening there. Each of the four characters have their own quests in each of the episodes, but they all seem to intertwine at some point. The four live in the center of the city, in a tree house, which is the dream of every kid, right? The show does not take place in the present, but rather in the future year of 2028. The four characters met during high-school, were transformed into infants, and took 20 years to get back into adulthood, so in total, they have been friends for 49 years. We told you that the show is whacky and full of weird things! So, obviously, you can't get bored playing Pig Goat Banana Cricket Games on our website, especially with characters like this. Next, we are going to tell you some more things about each of them, which is information we are sure you are going to appreciate. Pig is the least intelligent of the bunch, and he is often the one that gets the group into trouble. Apparently, he can survive life threatening injuries with ease. Goat is a female goat, and she loves to sing and to act. She is often annoyed by the guys, like girls usually are. Banana does not really care about anything, as he is lazy and just likes to waste time playing video games. He is afraid of monkeys, because they eat bananas, and is the one who loves to pull all sorts of pranks to the other guys. Cricket is the most intelligent, as he does all kinds of inventions, and he is the one who sorts the trouble that all the other guys have caused. The four characters will be the focus of the Pig Goat Banana Cricket Games, and we are pretty sure that you will enjoy playing with them a lot! Well, now you might ask yourself what kind of Pig Goat Banana Cricket Games you are going to play in this category. We are going to tell you all about this right here, or you can simply scroll up, and see the games for yourself. Like with most categories, you will find here some puzzle games or memory games, but we know that the more the show airs on television, the more fans it will have, and that will mean that even more games will be added for all of you, for free! Well, now you know so much about the world in the Pig Goat Banana Cricket Games on our website, so the only thing that you have to do now is to get started and play the games! Don't forget to also invite your friends on our website, so that they can also play Pig Goat Banana Cricket Games and more, because www.cute-games.com is filled with all the games one would want to play!